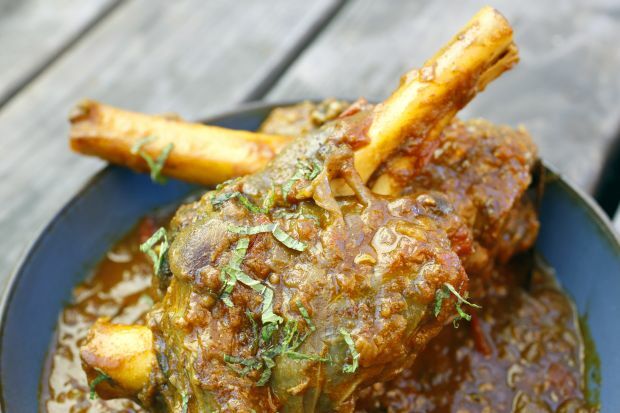 Lamb shank and apricot curry originated from North India. They typically use a lot of meat and nuts – sometimes fruits – in their curries because these ingredients help keep them warm during the excruciating cold weather. Apricot and lamb are just one of those food combos that just go so well together. They are a match made in heaven. The apricot brings some sweetness to the curry and enhances the flavours of the lamb. However, depending on your cut of lamb shank, the cooking time may vary. Tip to cooking this curry is to use a wide pot. Do not cramp all the ingredients together in a small pot or pan because if the ingredients are too stuffy, they can’t cook properly and it takes longer for it to be thoroughly cooked. Chef Sapna Anand published a cookbook, New Indian Kitchen, which is available at MPH bookstores. She also conducts cooking classes at At 19 Culinary Studio where she shares her cooking experiences and techniques. She blogs at My Test Kitchen and has a FB page under the same name. Picture courtesy of Sapna Anand. Rinse the lamb shanks and pat dry. In a heavy-bottomed pan, heat 2 tablespoons of oil. Then, sear the lamb shanks on high heat for about 5-7 minutes. What you're looking for is a light brown colour on the edges. Set aside. In another pan, heat another 4 tablespoons of oil, then add the bay leaves along with the rest of the whole spices, and sauté them until fragrant. Add onions and sauté them until they are soft. Add the ginger paste and garlic paste. Continue to stir for a minute. Add diced tomatoes and all the powdered spices. Add the yogurt and mix just enough to blend. Do not over-mix. Toss in the seared lamb shanks, season with salt and pepper and half a cup of water to start with. You may add more water if the sauce thickens too much as the lamb cooks. Cover and cook for approximately 1 hour, stirring occasionally. Add the apricots when the lamb is almost cooked. Cook till lamb is tender and the sauce is thick. Tip: When the lamb is easy to tear off the bone using a fork and flakes off easily means that the lamb is perfect and ready. Garnish with fresh pomegranate, pistachios, or coriander leaves. If you prefer using a meat without its bone for easy eating, you can replace lamb shanks with diced lamb. The cooking time will differ to about 45-50 minutes.